Elizabeth Turner of Springville passed away Wednesday evening, May 19th at Bedford Regional Medical Center at the age of 87. 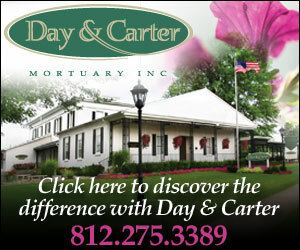 Arrangements are pending at Day & Carter Mortuary. Paul S. Bartlett of Heltonville passed away Tuesday evening, May 18th at Bedford Regional Center at the age of 77. Born in 1932 to Earl and Evelyn Bartlett, he had been married to Sandra Jo Spinks since 1958, was a farmer, a member of the Leatherwood Christian Church and was a former member of the Pleasant Run Township Board. He is survived by his wife, Sandra; his children, Debbie Hobson and her husband Eddie, Jeff Bartlett and his wife Lisa, Jerry Bartlett and his wife Sherri, Carla Wilson and her husband Earl, Roger Bartlett and his wife Golda, Kyle Bartlett and his wife Andrea, Cody Bartlett and his wife Heather and Todd Bartlett and his wife Stacy; as well as several grandchildren. He was preceded in death by his parents; two brothers, Harold and Fred Bartlett as well as a sister Marjorie Turner. Funeral services will be held on Saturday, May 22nd in the Elmwood Chapel of Day & Carter Mortuary with burial to follow in Bartlettsville Christian Cemetery. Visitation will be from 2:00PM until 8:00PM on Friday, May 21st at Day & Carter Mortuary. Linda Lee Montgomery of Bedford passed away on Tuesday, May 18th at the age of 51. Born in 1958 in St. Joseph, Missouri, she was a graduate of Westport High School in Louisville, Kentucky in the class of 1977 and was also a graduate of Murray State University. Linda had been married to Tom Montgomery since 1984, was a member of the Mitchell Presbyterian Church and was a Home School Advisor for North Lawrence Community Schools. She is survived by her husband; two sons, Bryan Montgomery and his wife Laura and Casey Montgomery; one daughter, Ashley Montgomery; her father Leo Swerbinsky; one sister, Jane Murden and one brother, Bryan Swerbinsky. She was preceded in death by her mother, Janet Swerbinsky. Visitation will be from 10:00AM until 2:30Pm on Saturday, May 22nd at Day & Carter Mortuary with graveside services to be held at 3:00PM at Green Hill Cemetery.